Pathetically, I am clinging to this last day of summer, turning it over and over in my hand like a seashell from a vacation I’m not quite ready to leave. I am not ready to let it go and embrace these crisp fall days as I’ve been able to in past years. The last winter we Michiganders endured was rough, putting it mildly. It’s impossible for me to get excited for the holidays which, I swear, we just finished celebrating last week! Seriously, didn’t I just put my Christmas decorations away? Maybe this is that “time flies when you’re having fun,” adage coming true. Ah, but I digress. I recently celebrated my thirty-third birthday. A few more lines on my face, a lot more gray hairs and some aches and pains I don’t quite remember having when I turned thirty-two are the worst of it. So I guess I’m lucky. The best part of it is this sense of peace I feel now. For the first time in my life, I feel as if I am enough without needing to keep up pretenses for people or things that are inconsequential to my life. I don’t feel as many “shoulds” weighing me down any more. When I start feeling the “should” monster creeping up on me (“I should really run an extra mile today.” “I should make a salad with dinner tonight”), I kind of hold up this figurative middle finger to it and think, the world isn’t going to stop spinning because I didn’t go for the extra credit today. I find this thinking seeping into so many areas of my life now, even with my kids. That’s not that I am neglecting them or anything, just not going crazy, breaking my back to do everything and be everything for them. “Noah, I will not tie your shoe with one hand and get Gracie’s shoes on at the same time just because you think you NEED to get your shoes on NOW rather than in another thirty seconds.” Instead, I am fine with letting him pout as he waits for his baby sister to get her shoes on and he can either attempt tying his own shoes, or wait for me to finish up with her. “Luke, I will color a picture with you after I am done making dinner,” instead of spilling spaghetti sauce onto his paper while draw a picture of a cow at the airport per his request. I think there was a part of me that worried before that my kids would believe me to be a mean mom by making them wait for things or by not compromising on every battle or by simply saying, “No” to some of their requests. But here is the amazing thing: They still love me! Here’s the proof. The other day, I said to Luke, “I love you, buddy.” I had been studying him while he was unaware and was just struck by how sweet and adorable he really is. He smiled bashfully and turned his eyes down to the plastic blue bowl of cheddar bunnies he had been noshing on. Then he looked up with his response and orange crap stuck in his teeth and said, “I love you too, Mom. Even when I don’t love you, I love you.” I laughed. So did he. It’s really that simple. Even when our kids are disappointed in us because we didn’t do exactly what they wanted, they still love us. It’s the same as when they disappoint us! We don’t love them any less. We may get annoyed with them, but we still love them. So why would we fear it would be any different for them? They’re little people with big emotions. They tend to be dramatic at times. They don’t realize the power of their words yet. Noah has said to me at least four times this week, “I don’t want you to be my mom anymore.” Within ten minutes, he’s hugging me and telling me I am the best mom in the world. Obviously, he’s not going to be scarred for life because I denied him ice cream for not finishing his dinner or because I made him sit down to do his homework before he went outside to play with his friends. I just finally made my peace with this. I know, it only took me thirty-three years to understand I do not have to beat myself up for disappointing people. And when I do, and I am very clearly in the wrong, the best thing to do is to own my mistakes, apologize and move on taking the lesson with me and to try not to do it again. Life becomes easier when we can forgive ourselves for our shortcomings and stop trying to meet impossible expectations. And I love my kids, but sometimes their expectations are just that; impossible. It’s better for them to learn now, sometimes life just doesn’t go our way. We need to teach them how to handle disappointment. It’s a life skill that is becoming scarce with the younger generations. So on that note, now that I fear I am embodying Tom Brokaw or Clint Eastwood or somebody just as old and with hair grayer than mine, I will end this post. I wish you all a wonderful week ahead made lighter by a few less “shoulds” in your own life. 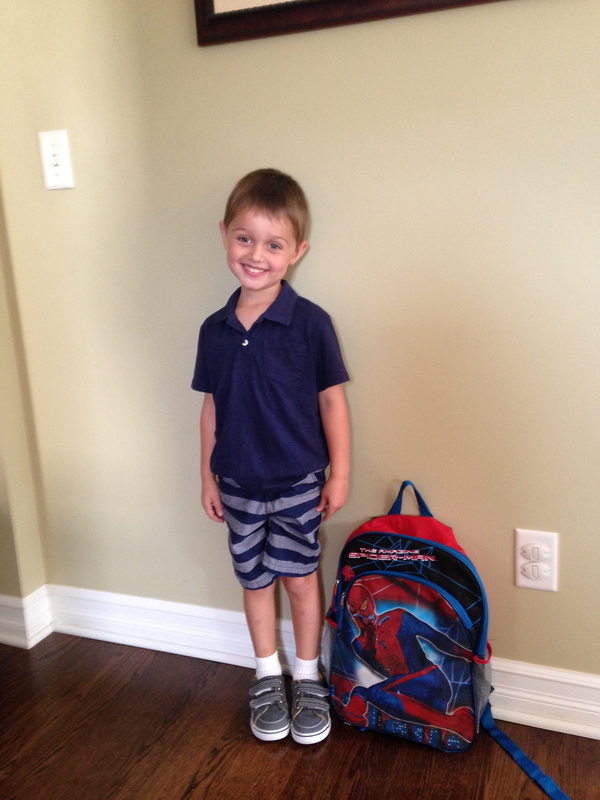 Luke’s first day or Preschool September 4, 2014. 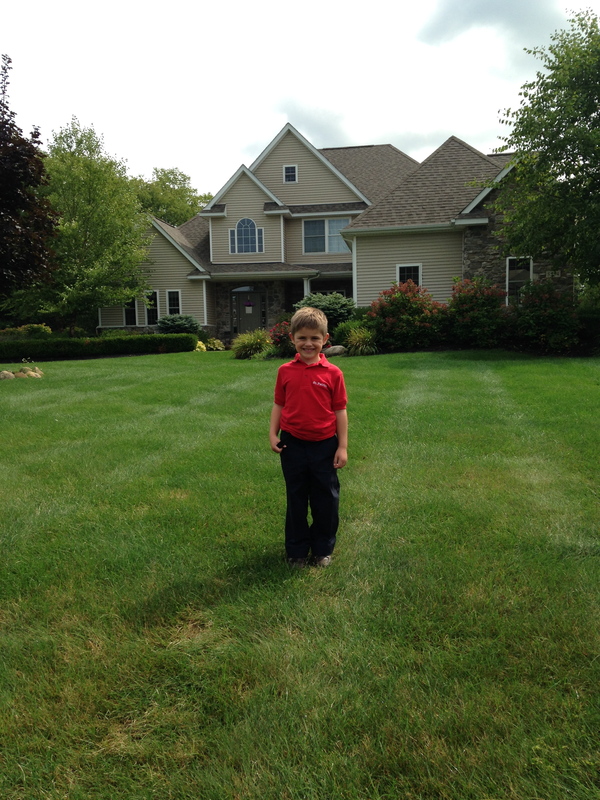 Noah’s first day of Kindergarten September 2, 2014.